Here is a sign that I saw yesterday at a Flying J gas station and covenience store near Gretna, Nebraska, roughly 20 miles west of Omaha, NE. 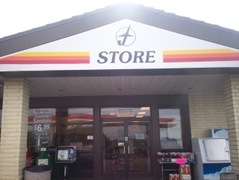 This sign was located directly below the store’s logo and above the front entrance to the convenience store. In my opinion, there are a few things wrong with this sign and its placement. 1). 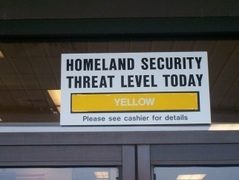 The Idea: Do existing and potential customers often ask what the threat level is today? 2). The Placement: Why would a store of any kind want to associate its brand with something alarming and frightening such as terrorism? 3). The Message: Fear. Do people know what the threat level colors signify? Will customers be taken aback that you’re notifying them of the threat level? The Big Deal: With brick and mortar stores, outdoor signage is crucial. Among other things, it can alert people of new offerings and the copy can appeal to customer desires. (example: 79 cent ICEE. Perfect on hot summer days.) This sign does not exemplify great marketing. Instead of evoking postive emotions and creating a desire, it turns people away more than anything. I dunno exactly where this store is, but i have seen”flying J” stores on the interstates that are frequented by truck drivers. Truck drivers see alot of stuff, and are quite professional too boot. maybe they’ve seen something that would be pertinent to an investigation were the alert level elevated? Just thinkin’, you know? It happens to be a really half-assed way of trying to reduce security vulnerabilities in the trucking industry, not a marketing thing. After having just driven cross-country, I can assuredly say that the Flying J is a truck stop chain. I’ve only seen the threat level posted at truck stops, not at run of the mill convenience stores that target the average consumer. There are certain things that truckers are required to do when the threat level increases. Does it help increase the currently abysmal state of trucking security? Unlikely. Does the Flying J want to post the sign/expect it to sell duct tape? Also Unlikely. I’ve also seen many of these signs in my travels as a photographer. As a career brand-builder, I woud like to respectfully offer an different take on these signs. It seems to me that this is neither a marketing tactic nor targeted at consumers. A Flying J’s primary customer is truck drivers. This sign is not posted at the truck stop for the general driving public, it is for truckers. The signs are an informative program to alert truckers to the terror threat level since it is personally relevant to them as potential targets of attacks. Post-911, many industries must be more vigilent in their addressing of security… public utlities, public transport, trains… and, trucking. In my travels, I’ve had numerous truckers tell me that their awareness of suspicious activity has heightened. In fact, I’ve had a few truckers tell me they now refuse to pull hazardous loads. If this is directed at consumers, I completely agree with you. Even as an informative service for trucker-safety, there is probably a better way to execute it. First, I’d like to thank those who commented on this post. I truly appreciate your insightful words. I’d also like to get some additional feedback and explore this topic even more. So, I’ll explain the situation further and pose some questions. This particular Flying J gas station had two seperate areas, with seperate entrances and exits for each. If, like you clarified earlier, the threat level sign was intended for truckers rather than the general public, wouldn’t the sign be posted only at the diesel pump areas — rather than above the main entrance to their store? Does Flying J do it solely to comply with trucking rules? If so, what are some additional steps they can take to do better job of communicating the information? I think delivering this message in poster form, without additional details readily available, does not help or improve the security situation. In my opinion, without involving politics too much, this situation could be greatly improved with a few minor adjustments. By changing the location of the sign and adding additional information, the Flying J could change people’s perceptions of the sign itself and its stores.